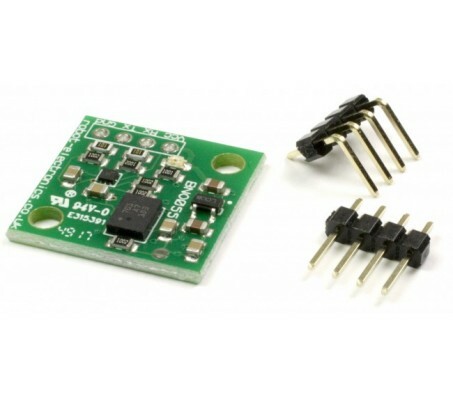 Description: Based around the fantastic BNO055 9 axis absolute orientation sensor from Bosch our module offers supply regulation and comms level translation, this means the module will work fine with any voltage between 3.3V and 5V. Default mode is serial communication, but this is easily changed to I2C with by closing a link on the board. Serial communication is 115,200bps 8N1 (8 bit, no parity and 1 stop bit) I2C communication is with a slave address of 0x50 (0x28 7 bit) and clock rate of upto 400khz. Module is supplied with straight and right angle connectors.